30 Days of Blogging - Day Nine. Changing your perceptions. - Let's keep that in the sanctity of your brain, shall we? 30 Days of Blogging - Day Nine. Changing your perceptions. I love this map. Apologies for the not-very-good photo; it's in an awkward position to photograph. Every time I look at this it shakes me up a little. 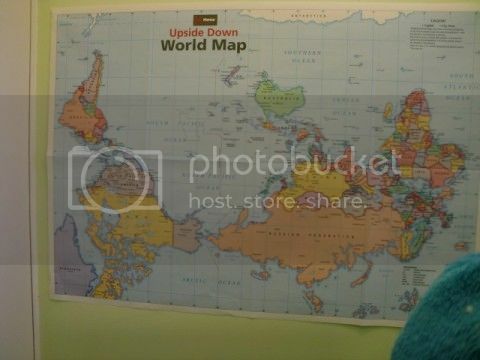 My Australian colleague has a wall map that while not the same as yours centres on the Australian neck of the woods rather than the United States/Western Europe and I find it hysterical how many people it freaks out. All a matter of perspective! Exactly! That's what the map is designed to prove, I think. I looked at your previous day's post, and LJ seemed to be complaining about the photo you'd put at the beginning, so that's probably it. Yeah, just not sure why it worked perfectly on preview and only then decided to bork itself. I'll have to try deleting and replacing photo and youtube link tonight, to see if I can get it to work properly, otherwise it will drive me nuts. You must have seen this scene from the West Wing, right? No, I hadn't seen that until now. When they flipped the map I clapped! The Mercator projection is such an arbitrary picture, it's nice to see it challenged. Oh, what an excellent map! The first time I went to Tate Modern, the temporary exhibition was of artwork to do with maps. I *loved* it. One that I particularly remember was a colossal representation of Great Britain made out of Ordnance Survey maps. The outline of Britain was okay, but as you got close to it, you found that all the maps were in the wrong places so that all the placenames were somewhere else. A piece of East Anglia would be used to represent the Yorkshire coast, for example, or Birmingham placenames were scattered all over Cornwall. It has stuck in my mind ever since. That would be a fascinating map! It would be quite fun, too, to work out where different towns ended up.